We are constantly trying to make the best product that Pipe can be with each new iteration, by intertwining our vision with feedback from our clients. We cannot control the length of the videos recorded from mobile devices. The OS of the devices does not permit specifying the maximum recording length from the browser. To address this issue we’ve implemented a new option, which when activated, Pipe will cut videos recorded with a mobile device if they are longer than the Max Recording Time setting from the embed code. Existing videos prior to activating this option will not be affected. By default this option is disabled. It can be accessed from the account area. Until recently, all of the recorded videos were being automatically saved. We’ve realized that this may not be helpful in some scenarios, for example if a user needed to make multiple recordings but only one will have been submitted, there was no way to decide which video recording was supposed to be the final version. So we’ve implemented the option of disabling this when generating an embed code. The option can be found in the Embed tab. 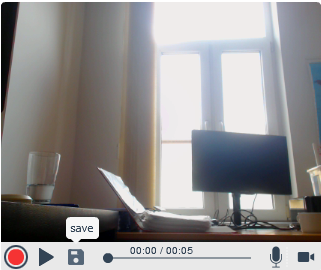 A [Save] button will be shown in Pipe’s desktop recorder when the option is disabled, which when clicked will trigger the video saving, conversion and storing processes. This can also be controlled through the new save() JS Control API. Pipe will automatically detect the language of the mobile browser in which it is run and will be displayed in that language if available, if not it will default to English.